Your travel plans don’t always work since things in life can change so easily, so sometimes you need to get a refund on a non-refundable flight. Typically on the most affordable airline tickets, there’s either no refunds or a very expensive cancellation fee. 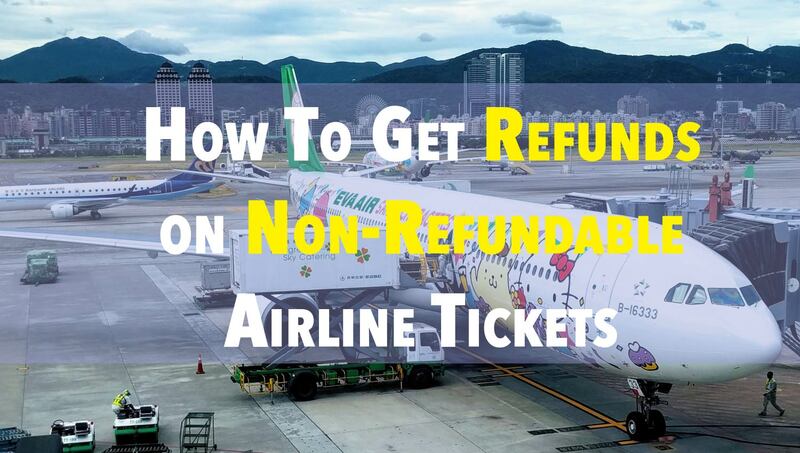 These tricks apply to all tickets including the non-refundable tickets. I’ve use a few of these tricks in the past because I always book the best value ticket which never has free cancellation. Did you just book your ticket but realized you booked the wrong date? Or put in your name wrong? Or decided to go somewhere else? Well you’re in luck! There’s a free 24-hour cancellation window. When booking flights through most U.S. travel sites, they provide a 24-hour free cancellation window. This law applies to all flights departing on arriving on U.S. land. Airlines will typically email you if there’s been a schedule change to your flight. This happens often. If there’s a schedule change of at least 30-90 minutes (depending on the airline), you can cancel your flight for free. Just contact the airline and tell them the schedule change will severely impact your plans and ask for a refund. Sometimes the airline doesn’t contact you and you don’t find out the flight has been changed until your at the airport, so monitor it closely around departure time. Paying for priority boarding allowed me to see everyone else board the plane first. Many people fake being sick to get a full refund and airlines want to make sure you’re not faking. These days you’ll have to jump through many difficult hoops to prove this and get a refund. If you, your travel companion or a close relative dies, you can get a refund but will have to present proof. If you’re in the military and your orders change, you can provide that information to the airline and get a refund. I haven’t tried this because I’ve never been in the military, but if you have and know the lingo take a shot. You can cancel your flight for free if you have Jury Duty during your travel dates. You’ll have to find a way to get Jury duty though. ⟵The Ultimate Guide To Free Travel: Credit Card Bonuses!